But will it make it to Apple App store? 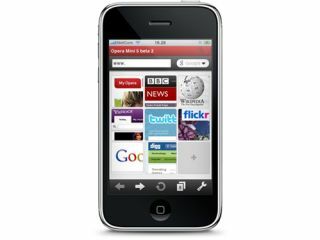 Opera Mini will be shown running on an iPhone at Mobile World Congress in Barcelona this month, although the company has yet to get the application through Apple's rigorous vetting process. Apple has been anything but accommodating when it comes to allowing rival browsers onto the iPhone, but Opera's open statement of intent over the platform does, at the very least, sound confident of success. Opera Mini is a popular mobile browser, and could prove a competitor to the pre-installed Sarafi browser that is already on the iPhone. "We are thrilled to offer journalists and partners an exclusive preview of Opera Mini for iPhone during the year's biggest mobile event," said Jon von Tetzchner, Co-founder, Opera Software. "This is a unique opportunity to introduce the fast, feature-rich Opera Mini experience for the iPhone, and to showcase our latest beta releases of Opera Mobile and Opera Mini on other platforms and devices. "Opera's mission is to bring the Web to the world, and by making Opera Mini available on yet another platform, we are one step closer." The browser running on a iPhone will be just one of Opera's showcases with the company also trailing Opera Mobile 10 beta 3 on Symbian S60 and Windows Mobile handsets, Opera Mobile 10 beta running on Android handsets, Mini 5 beta, running 'on a variety of handsets and platforms' and the company's cross-platform Widgets Manager beta, running on Windows Mobile and S60 handsets. But it will be the iPhone browser that garners the most attention, and raise the question as to whether Opera Mini will soon be making a public appearance on an Apple handset near you.